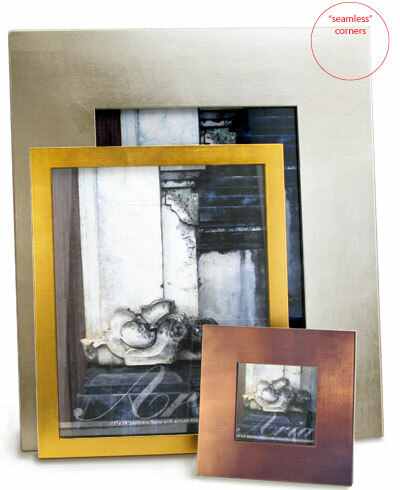 To create Aria, gilding artisans hand-apply a gorgeous metal leaf finish onto the pristine surface of the three “Seamless” frame styles: Modern, Metro & Max. The result combines crisp, machine-made shapes with the rich individuality of an artisanal finish. Smaller sizes are individually boxed for gift giving, but Aria is a particularly dramatic gallery-style frame available in a number of larger sizes.